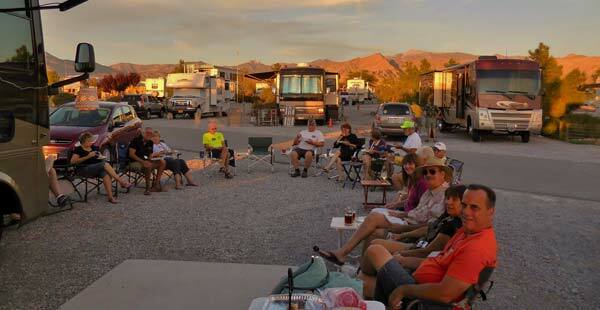 We welcome RV travel clubs and RV group rallies at Wine Ridge RV Resort. We have special rates for all size rally groups. Also, we can help you with making arrangements for meeting space in our Clubhouse, and our rally coordinator will help you plan your event, from recommending local attractions to helping you choose restaurants and day tours. Sparkling clean, with superb customer service, Wine Ridge RV Resort offers the best value only an easy one-hour drive from Las Vegas, and a local shuttle service company provides transportation to the Las Vegas Strip at a very reasonable price for your convenience. For more information, please call us at 775-751-7805. *For large groups of 30 or more rigs, the wagon master will be given a complimentary space. The W.M. will be responsible for the number of reservations required, deposits and final payment to the resort. Also, the W.M. will be responsible for assigning the RV sites to the individuals from the sites set aside by the Wine Ridge Resort for the rally group, and provide a list of those attending the rally to the resort. We will reserve sites up to 30 days prior to the rally date. If reservations are not secured with a deposit by that date, we will start releasing sites as needed. Group numbers must be finalized 7 days in advance of arrival, with the final payment. Please give us 7 days in advance if you need to cancel the rally. A $10.00 per rig fee will be applied for any cancellations. If the group cancels less than 7 days before arrival date, the deposits will be forfeited. A. Our Wine Ridge Club House & kitchen for 2 events, for 4 hours each. B. Lower pool & BBQ area for 1 event (or 4 hours). *If the resort handles all the individual reservations and assignment of the sites for any rallies over 15 rigs, there will be a charge for the use of the club house and /or the lower BBQ and pool area for private events at $10.00 per hour. All paper and/ or plastic goods, serving utensils, plates etc. for serving and eating. Coffee, creamer, an sugar (if using the coffee pots owned by the resort). Please provide your own items for decoration needs. Do not use anything that would leave holes or would remove paint from the walls. Use only battery operated candles: no open flames or real candles. Please leave the kitchen clean, unless you have made prior arrangements and paid for house keeping to clean. Place all trash in the containers. Make sure all decorations are removed that belong to the party. Wine Ridge RV Resort is not responsible for any illness or injury resulting from the use of our facilities. Ice for $2.00 a bag/ small parties can use the ice machine. Coffee maker: please make sure to clean the coffee maker when finished. BBQ grill located at the lower pool area. The BBQ must be cleaned after your use Please turn off the burners when finished.